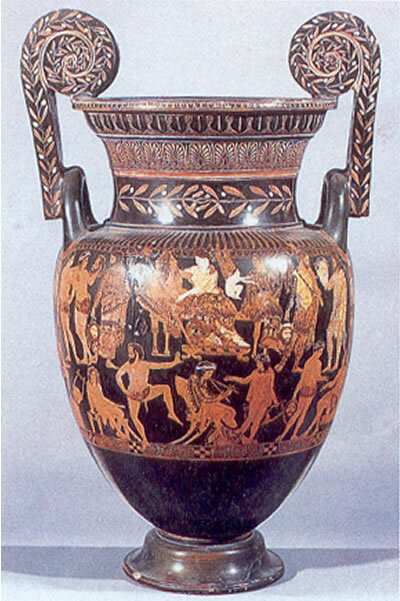 The krater was a common type of vessel in early Greek pottery. This 8 th- century example from the Dipylon cemetery, about 101. 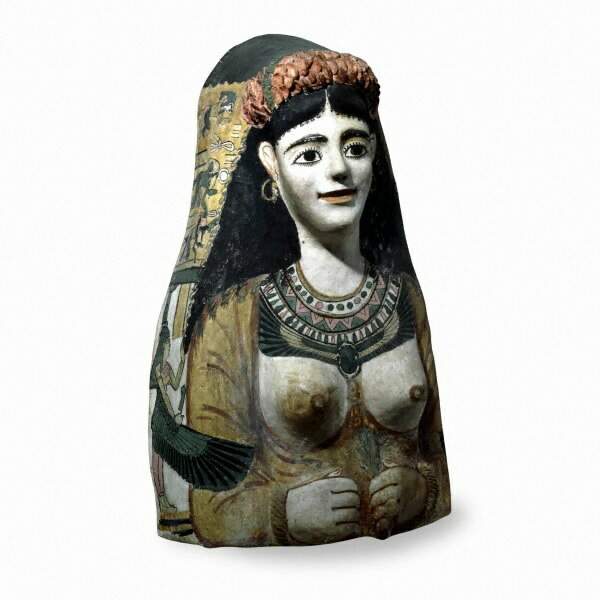 25 cm (40 — in) high, is decorated with a funeral procession in which the figures are highly stylized. The band around the top features the meander design associated with early Greek art. 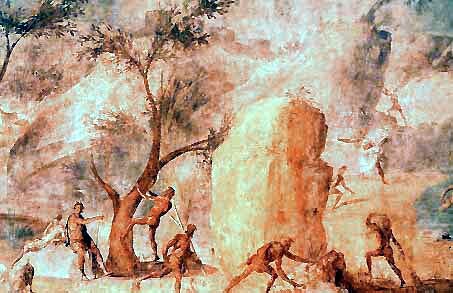 Once, when Herakles was traveling with his wife, Deianeira, they came to and had to cross the river Euenos. The river was swollen by rain, but the Centaur Nessos was ferrying people across, for a price. Herakles could ford the river with little trouble, but he agreed to let the Centaur carry Deianeira across. In the middle of the river, though, Nessos attempted to accost, or make off, with his passenger. Herakles, responding to his wife ‘s screams, shot the Centaur with an arrow. However, as he was dying, Nessos told Deianeira that, if she ever suspected her husband of infidelity, a shirt soaked in his (Nessos ‘s) blood would be a love charm, and bring him back to her. She had reason to be suspicious, and soaked a shirt in the centaur ‘s blood. When her suspicions came to pass, she sent Herakles the blood – soaked shirt. When he put it on, the poison, from the Hydra, that he had dipped his arrows in, burned him so that the only cure was his apotheosis. 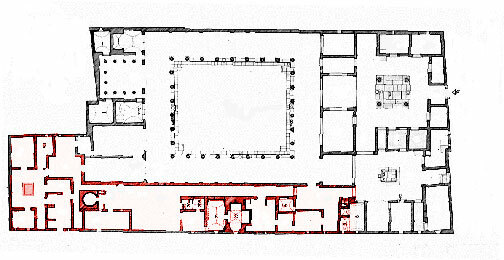 version in all details. 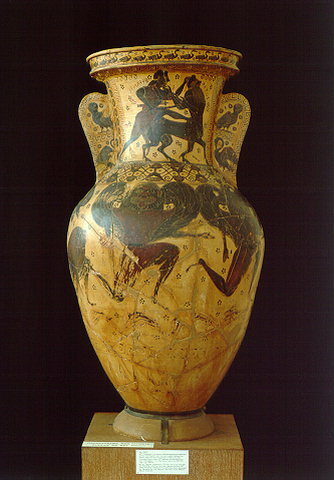 For example, the Nessos Amphora (left) shows Herakles and Nessos, both identified by inscriptions, in close combat, with the hero dispatching the centaur with his sword. 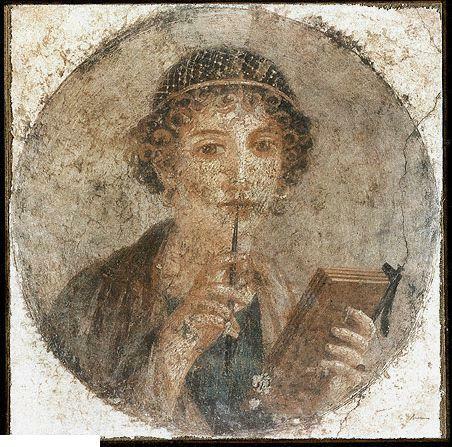 Deianeira is not present in this portrayal. It is supposed there were a number of versions of the story current at one time or another, and the differing portrayals reflect this. 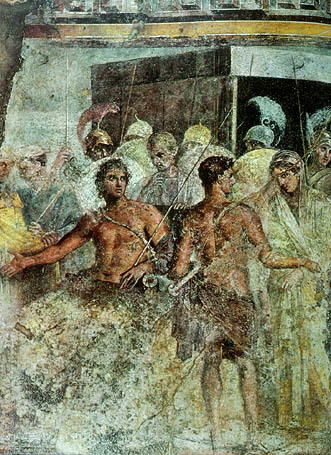 There are also depictions with only Nessos and Deianeira, at various stages of the assault. In some, she ‘s contentedly riding, in others, he’s making his move. 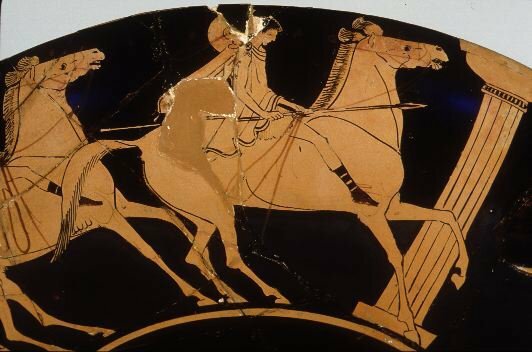 Besides Nessos, a centaur identified as Eurytion is also frequently shown as being chastised for an assault on Herakles ‘s wife (e.g., London 96.7 – 16.5), and, on a stamnos from Polygnotos ‘s workshop, Naples 3089, a centaur inscribed Dexamenos, perhaps in error for Eurytion, is in similar straits. 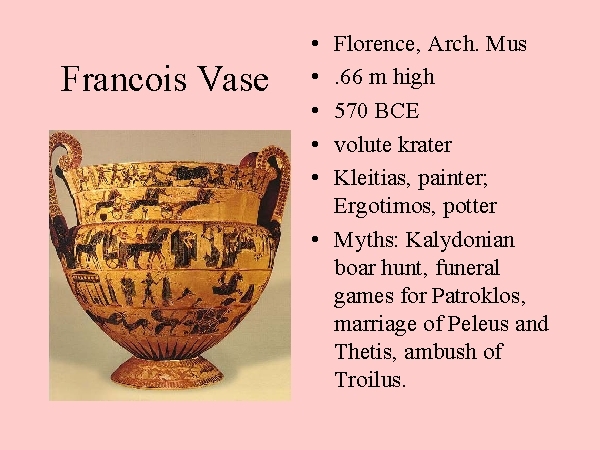 Slide 4: Kleitas & Ergotimos Francois vase (Florence) c.560? 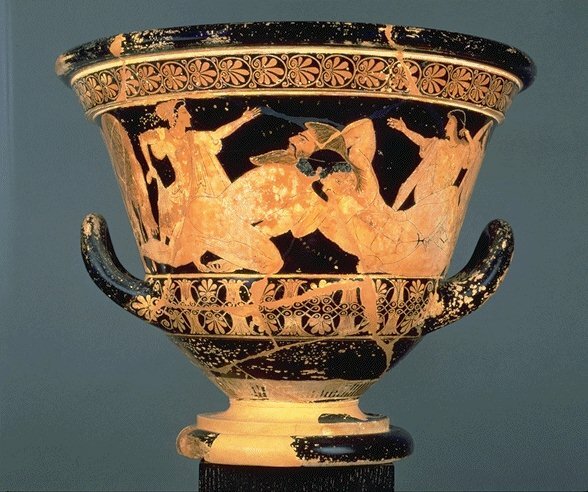 This beautiful black figure vase painting by the Amasis Painter depicts Dionysos with a pair of attendant maenads. 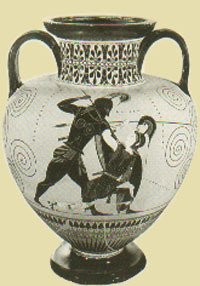 The image appears on a type of vessel that the ancient Greeks called an amphora. 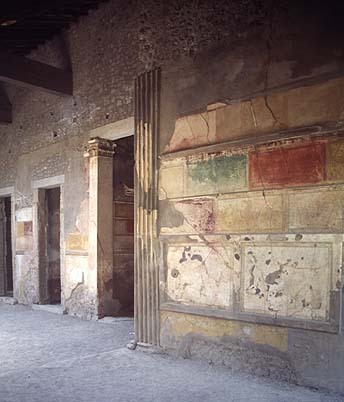 Amphorae (the plural form of the word amphora) were used to store such treasures as wine and oil. The body of the vase is adorned with a gorgeous group of figures. 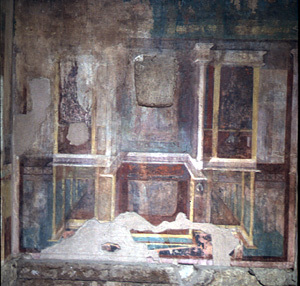 Dionysos, the Greek god of wine and the theatre, stands on the left. The god is bearded and holds a kantharos (this kind of wine cup is often used as a symbol of Dionysos) in one of his hands. 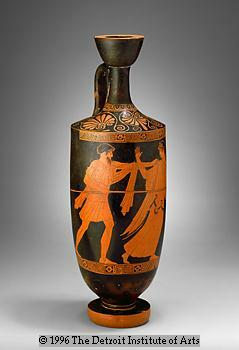 The right side of the vase features two women, who are often identified as maenads (female followers of Dionysos). These women are intertwined and clad in dark, intricately detailed garments. 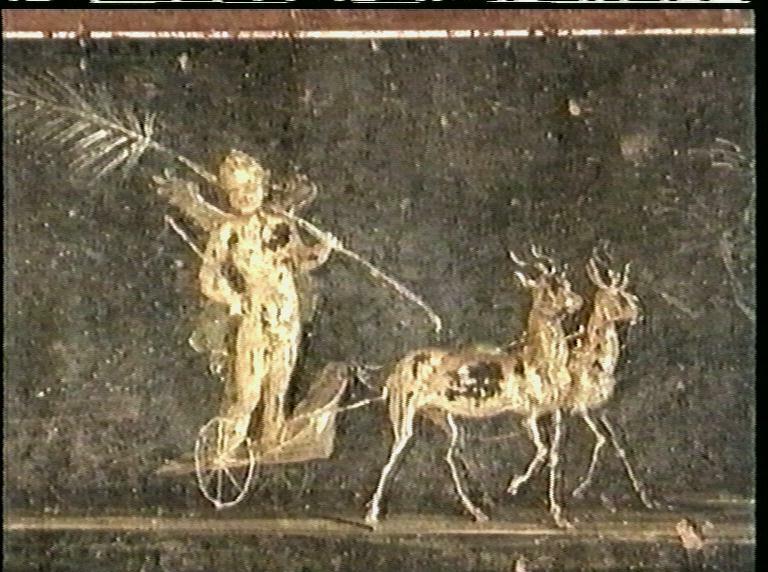 One of the maenads is holding a hare, while the other is carrying a deer. 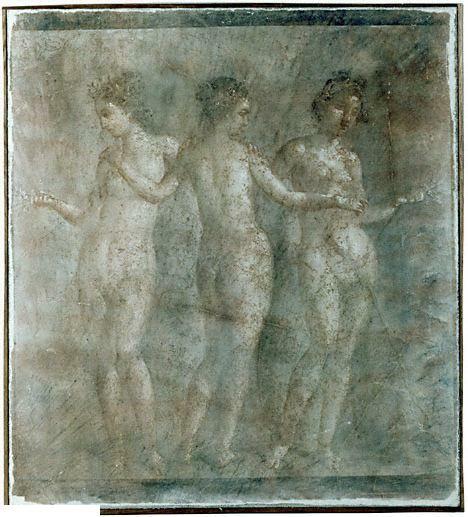 Each of the female figures is also grasping a sprig of stylized ivy. 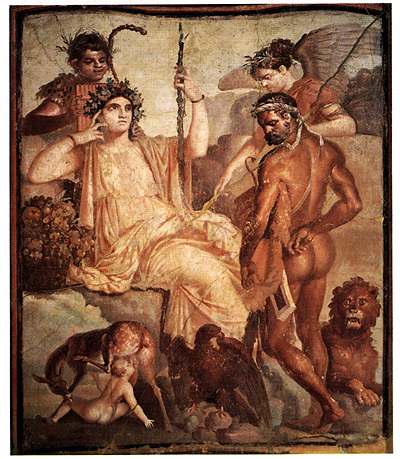 Notice how the skin of the male figure – Dionysos – is dark, while the female figures – the maenads – both have pale, buff colored skin. The decorative details on the vase are bold and beautifully rendered. Large spirals serve to frame the composition in the center, and the figures also stand on a band of stylized grape leaves. This enchanting work is a masterpiece of the black figure style of vase painting. 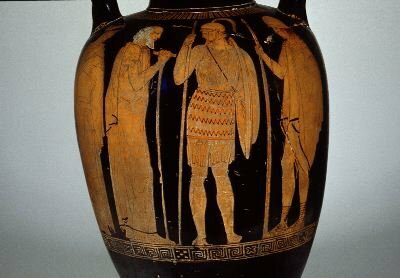 This amphora shows the increasing skill of the Athenian vase painter in depicting the human form and in telling the human story. It was common for the vessel to be thrown and assembled by one person, while the painting was accomplished by another. This amphora is particularly well proportioned, with its volume swelling from the foot to its shoulder, from which elegant handles spring to the neck. 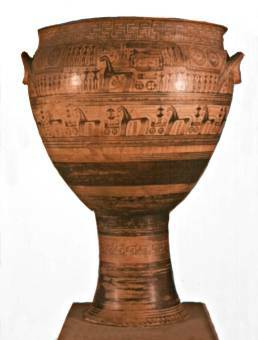 The painter of this amphora, Exekias, was a painter who excelled in composition and that is evident here, where light and dark areas are skillfully balanced. 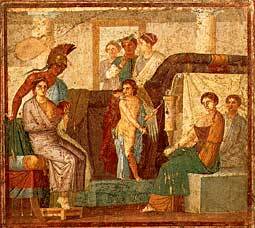 The scene is from the Trojan Ware, and we see two of the most famous figures from this story, Achilles and Ajax. Achilles is at left, and Ajax is on the right. 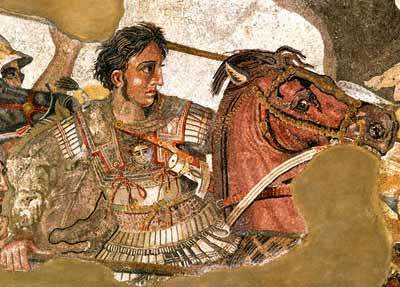 Both have rested their shields and spears, and Ajax has removed his helmet. 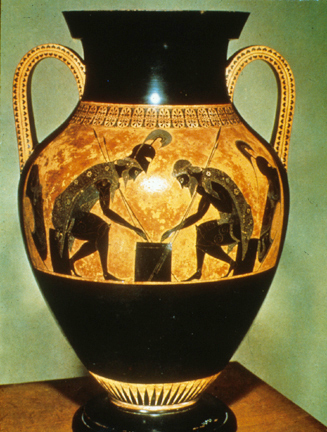 Note the skillful way in which Exekias has drawn the spears to create a triangular line which leads the eye to the handles. Also see how this line is completed by the shapes of the shields, bringing our eyes back into the composition. These two warriors are shown taking a respite from their battles, and playing a game of checkers (draughts) on a board. They intently focus on the game, moving their pieces around the board. Note the frontal eye, which seems to stare at the viewer, even though they are looking at the game board. While body proportions are still not anatomically correct, Exekias indicates volume and shape by using sgraffito, carving linear detail into the black shapes of the figures. Rather than focusing on the battles to come, Exekias here captures the more human moment of two warriors at rest, trying to take their minds off their worries of what is soon to come. 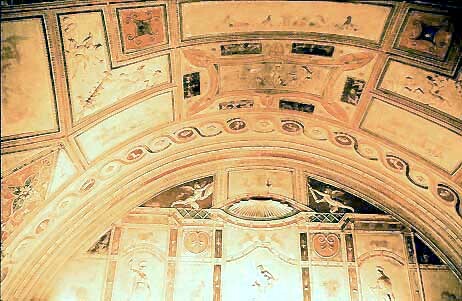 A double honeysuckle frieze surrounds the vessel above the action. The population at this time was mostly illiterate, but the action depicted here would have been recognized by most people. The story illustrated here is of a war that took place over 600 years before this vase was painted, and together with the writings of Homer, these vases vividly illustrate the history of this time. Achilles is best known from the phrase ‘Achilles Heel.’ He was the commander of the Trojan army and thought to be invincible…. 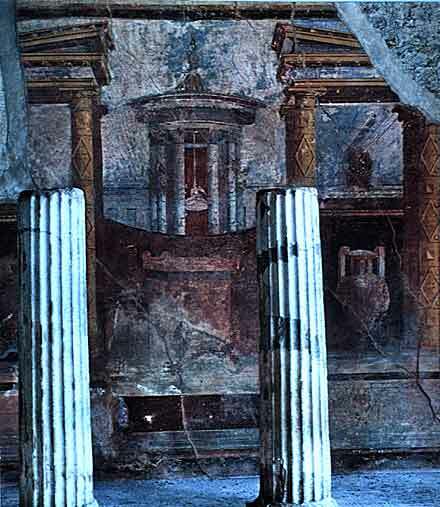 Euphronios was a vase – painter and potter working in the red – figure technique in Athens from about 520 to 470 B.C. He signed his name on eighteen vases, six times as painter and twelve times as potter. 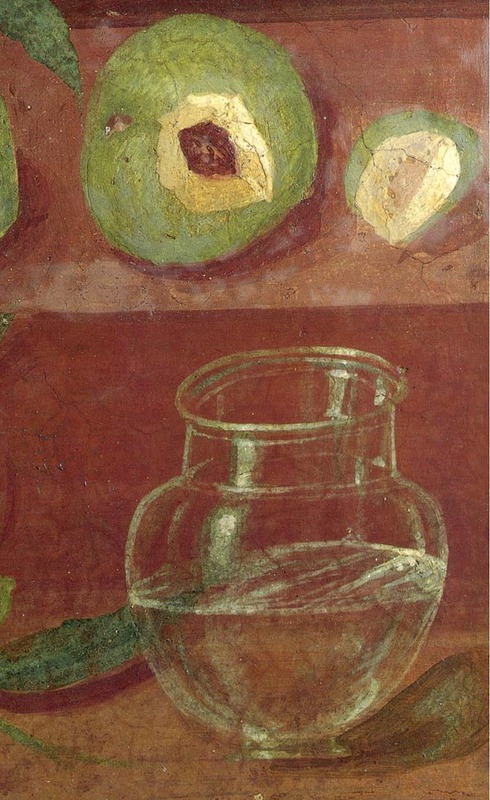 To judge by their drawing style, the vases that he signed as potter seem to be later than those he signed as painter. In his early career Euphronios was one of a group of Athenian vase – painters who have been named the Pioneers by scholars today. 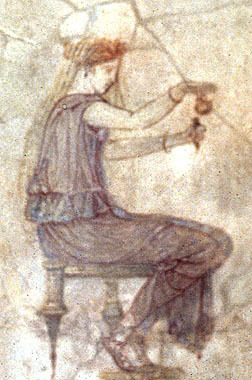 Working about 520 to 500 B.C., they were the first to exploit the possibilities of drawing in the new red – figure technique. 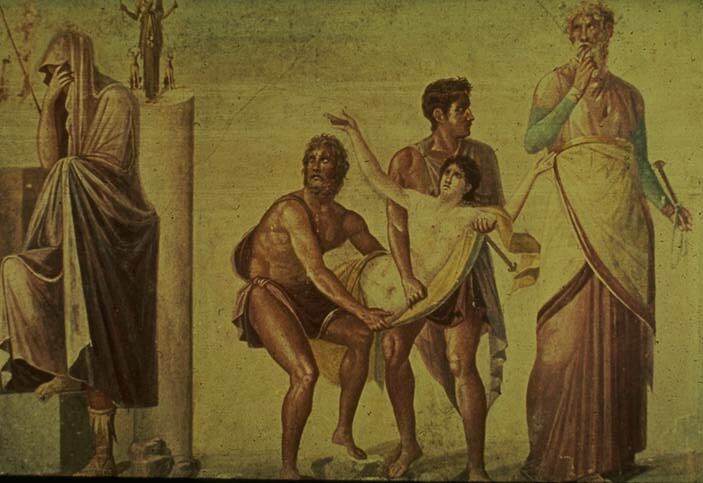 Like his colleagues, Euphronios was interested in showing the human body in a variety of poses, and he used overlapping and foreshortening to give his scenes a sense of depth. On their vases, the Pioneers often depicted one another and even exchanged playful insults about each other. Later in his career, Euphronios ‘s signature as potter appeared alongside the names of several of the finest vase – painters of this period, including Douris, Makron, and Onesimos. The precise details surrounding Euphronios ‘s later role as potter are unclear. Perhaps as he got older and his eyesight failed, he switched to the more tactile, less visual craft of potting a vase. Or the potter signature may mean that Euphronios actually owned the workshop, a sign of his prosperity and success in the industry. 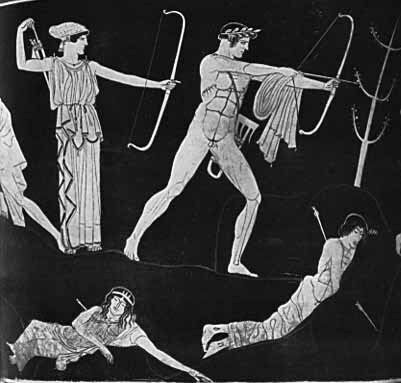 An Athenian red figure volute krater (signed by the painter, Pronomos), from the end of the fifth century, showing the cast of a satyr play. 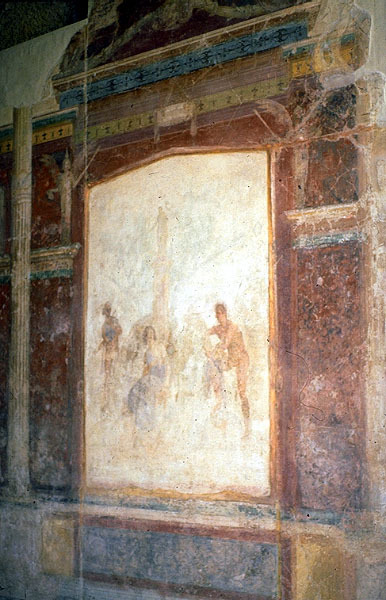 Note the flute player (also lyre players), phallos, masks, Dionysos (center), and actor dressed as Herakles (all of which could appear in Old Comedy). 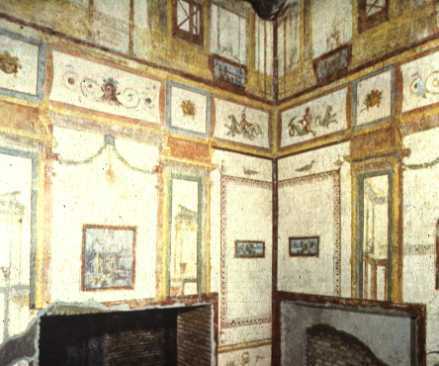 The Domus Aurea or golden house is one of Nero ‘s most extravagant projects.After two – thirds of Rome were decimated by the great fire in 64, Nero used this land as a site for his new palace.It was not so much a palace as a series of buildings scattered over a landscaped countryside including an artificial lake.It was extravagantly crafted, boasting rooms and hallways decorated almost entirely in gold.Severus and Celer, the architects in charge of the project, utilized a revolutionary movement in architecture that emphasized arches and interior spaces. 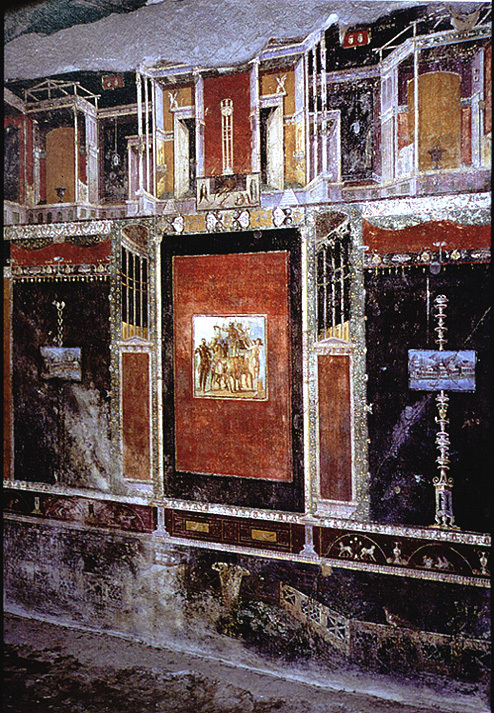 The painting has been criticized by art historians because of a perceived lack of unity in technique and composition. The figures look, to some critics, as if they had been copied from several different originals.